A .DMG file is a file format for Macintosh OS X. This file is a disk image and is treated as a disk when opened. Its a very useful format for Macs but it be occasionally used on Windows computers. One Mac user asked why a Windows user would want to open a .DMG file since the contents are most likely useful on a Mac. These files would be opened if they are on a web site hosted by Windows 2008 Server. An attempt to download it would lead to a file not found error. This can be fixed by defining a MIME type for DMG in the Internet Information Services Manager. 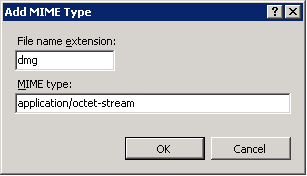 The file name extension is dmg and the MIME type is application/octet-stream. Now when you click on a DMG file on a web site, you will be prompted for a download location. A compressed OS X file might be in a bz2 format. Below is the required information for adding a new MIME type in Windows 2008 Server.